One of the biggest events of the year for knife nuts is Blade Show. Put on by Blade Magazine, this industry wide convention draws a cavalcade of steel-toting enthusiasts to Atlanta, Georgia, where custom knives are fought over and new production designs are revealed. For the last several years, their Overall Knife of the Year award has been granted to blades that are…let’s say, of questionable utility. Beautiful, and without a doubt technical marvels, but they bear more resemblance to concept cars than to utility vehicles. To find designs that are within the reach of the hoi polloi, one should look at some of the more obscure awards, which focus on budget, innovation, and place of origin. This review focuses on one such design: the Spyderco Manix 2 Lightweight, which won the 2010 Blade Show award for Most Innovative American Design and has since garnered quite a bit of critical praise. Nowadays, the Manix is seen as part of the vanilla Spyderco line, but that’s not how it’s always been. At the time, it seemed like the Manix was the way of the future. Thin, fully flat ground blade? Check. Thumb hole? Check. Innovative lock that kept your fingers clear of the blade? Also, check. That all of these features are found at a pretty economical price point and on a blade that’s made in the U.S.A. is impressive today, but was a much bigger deal when the question of the day was Benchmade vs. Spyderco. The Spyderco Manix 2LW measures just over 8” overall, with a 3.37” blade and a 4.66” handle. The Manix 2 LW is made in the USA. As its name would imply, the Manix 2LW doesn’t weigh much – only 2.9 oz. – a weight that’s pretty remarkable for a knife this size. It’s worth mentioning that the cutting edge is actually 2.88” because of the inclusion of a 50/50 finger choil. I applaud that decision. Spyderco is famous for their ergonomics, and the finger choil is part of that recipe. Spyderco chose Carpenter’s BD1, a relatively unknown steel, for the lightweight version of the Manix 2. According to the data sheets, BD1’s performance should be the equivalent of high quality 440c. Most online feedback indicates the same. In my experience, it’s been difficult getting the BD1 as sharp as I’d like. Its edge retention isn’t the best, and requires regular maintenance. If there is one attribute it excels at, it is corrosion resistance. I’ve forgotten to clean this knife after cutting citrus before, but even that didn’t leave so much as a mark. For all the questions about the blade steel, Spyderco hit it out of the park with the blade shape (and grind). The leaf-shaped blade is a mainstay in their product line and never disappoints. When paired with a full flat grind and fairly thin stock (.125”), you’re almost guaranteed success. Extensive use in the kitchen and the field bears that assumption out. My sharpening issues aside, the blade performs very well. The smokey mirror finish Spyderco put on the Manix is easy to clean and doesn’t attract fingerprints like a higher polish would. The handle on the Manix 2 Lightweight is made of fiberglass reinforced co-polymer, or FRCP. It is very similar to the fiberglass reinforced nylon (FRN) Spyderco uses on the Delica/Endura/etc. When compared side by side, FRCP is stiff, while FRN has a bit of give to it (akin to rubber). I own knives with both as handle materials, and I don’t know if I have a preference. As with any plastic handle, there will be folks who complain about the material feeling cheap, but I don’t mind it. I prefer the translucent blue handle over the black handle. This knife is very well-suited to backpacking, and a bright handle helps ensure that your knife doesn’t get lost among the foliage. I’ve found the ergonomics to be just as good as I’d expect from an in-house Spyderco design (read: excellent). Some folks complain that the handles are too blocky. Those people need to find something else to complain about, because I could not find a fault with the ergonomics. The 50/50 finger choil allows the user to choke up for better push cuts, while the rear grip is well-suited for slicing and draw cuts. Spyderco’s bi-directional grip pattern is very effective at gluing your palm to the handle without being abrasive. I will say I could do without the jimping on the interior of the handle. Spyderco’s wire clip seems to be pretty polarizing, at least if you take online comments seriously. Some love it because it’s discrete, doesn’t generate a hotspot, and doesn’t shred the edges of your pocket. Those who hate it complain that the wire clip wiggles around and doesn’t offer enough tension to keep the blade secure in the pocket. I’m in the former camp; every wire clip I’ve handled has had plenty of tension, and I prefer the practical advantages outlined above. Between the low weight and excellent clip, this knife is a dream in the pocket (particularly for its size). I’ve mentioned this before, but the knife market is almost exclusively focused on flippers right now. Personally, I’ve always preferred the thumb hole as a deployment method. They’re just as easy to flick, but much better when it comes to slow-rolling the knife open. I also don’t wear my fingers out fidgeting with Spydercos the same way I do when I’m messing around with a flipper. This is a very nice execution of the thumb hole. At 14mm, it’s large enough that opening the knife is never a problem, even while wearing gloves. The interior of the cut out has been nicely polished and slightly chamfered. If it wasn’t for the lock, I probably wouldn’t like this knife as much as I do. The Manix is equipped with the Caged Ball Bearing Lock, which is frequently compared to Benchmade’s Axis Lock and SOG’s Arc Lock. All three offer ambidextrous manipulation of the lock without putting your fingers in the path of the blade. Out of the three, the CBBL is my favorite. It fixes the one problem that I have with the other offerings: a weak detent. On the Manix, the detent is not only quite firm, but crisp as well. There’s a level of security knowing that the blade isn’t going to flop open with a wave of the hand. My thoughts on the Manix 2LW are generally positive. If it weren’t for my issues putting a keener edge on the BD1, I’d carry it more frequently than I do now. Even with that handicap, it’s a great knife. The Manix 2 LW is available at most retailers for around $80.00. 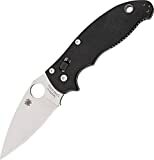 If you’re worried about the steel (my experience seems to be an outlier), Spyderco also offers the Manix 2LW in CPM-S110V for around $35 more. That aside, the Manix is arguably in an awkward spot on the product line. For a relatively small amount of money, you could instead purchase a Paramilitary 2, which is widely regarded as one of the best knives available (regardless of price point). This begs the question: budgetary concerns aside, is there a niche the Manix fills that the Paramilitary doesn’t? I think there is. As much as I love my Paramilitary 2, I think the Manix 2LW actually makes for a better outdoors knife. Specifically, for backpacking. The bright handle, low weight, and easily maintainable steel are all desirable qualities for a blade you can tote into the backcountry. Whether you want a knife for the outdoors, or you’re looking for a bigger everyday carry blade, the Manix 2 Lightweight is sure to satisfy. 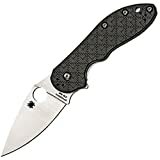 I recommend purchasing the Spyderco Manix 2 LW at Amazon or BladeHQ. Please consider that purchasing anything through any of the links on this website helps support BladeReviews.com, and keeps the site going. As always, any and all support is greatly appreciated. Thank you very much. The Spyderco Manix 2 is one of those knives that I have been meaning to review pretty much since the start of this website. I’ve examined a lot of blades since then and now I finally have my thoughts on the Manix 2 together and can write on this fantastic heavy duty folding knife made in the good ole USA. The Manix 2 is what I would call a “medium” sized folding knife. It is stoutly built and highly functional. We are looking at an overall length of 8 inches and a blade length of 3-3/8 inches. At 5 ounces this knife is going to be heavier than most other knives “in its class” but what you get for this weight is a strong design with killer ergonomics. Just to put things into perspective, the Spyderco Tenacious has roughly the same dimensions but comes in a full ounce lighter. Part of what makes the Manix 2 on the heavier side is the hollow saber grind (also it has full liners – more on that later). This makes for a stronger blade, but the trade off is weight. Many users don’t particularly care for the saber grind, preferring a full flat grind. In that case, I would advise trying to find a “sprint run” (limited edition) of the knife as Spyderco often makes them with a full flat grind (like the version wearing BD30P in my video review). The blade shape is a classic leaf design and the tip is fairly delicate. There isn’t a ton of belly on this knife, but I find its plenty for most every day tasks. Blade steel on the standard Manix 2 is 154CM. A classic steel, 154CM is known for being an all around performer. Edge retention, rust resistance, toughness and sharpen-ability are all good. I gotta say though if you want a more exotic steel or a full flat grind, Spyderco has been rolling out some really cool sprint runs of this knife. It’s going to cost you more, but it’s possible to get this knife in S30V or even S90V, although you might have to head to the secondary market to do it. Who knows, down the road Spyderco might release this knife exclusively with a full flat grind like they did with the Endura and Delica, so if you like the saber grind I would get it while you can. The Manix 2 has a tried and true handle design: G10 scales over stainless steel liners. The G10 on the standard Manix 2 is black and well textured. I would say the G10 is aggressively textured and provides great grip and tactile response. The liners run the entire length of the handle and are not milled out (or “skeletonized”) at all in the standard version which adds substantially to the weight of this knife. The handle is a partial flow through construction with a metal backspacer taking up the front part of the handle, and some pillars holding the back part of the handle together. Another notable feature on this handle is the over-sized lanyard hole. For a stout blade like this, a large lanyard hole is a very practical feature – if you take this knife camping or regularly engage in long and heavy cutting tasks, a lanyard could be a great option for you. The ergonomics on the Manix 2 is where this knife really shines. At a glance you can see all kinds of stuff going on with the handle. First off, you have two large choils. This allows you to choke up on the blade for detail work generally get a comfortable grip. Also, a liberal amount of jimping has been applied to many parts of the handle (including the thumb ramp and choil of the blade itself). This jimping is very sharp (some say it’s even “too sharp”) and ensures your fingers wont slip. This is a super comfortable knife and it works well in many grips. Combine that with that extra bit of weight and I find it hard to put this one down. The only downside to the great ergonomics is that the handle (and folded knife) is kind of bulky in the pocket. You get a great handle but you lose some ease of carry. The pocket clip is a classic Spyderco “hourglass” clip, mounted very high on the knife for a nice deep carry. It’s not a 4 corners clip, but it allows for ambidextrous tip up carry which works very well for me. The rough G10 may start to tear up your pocket a little – if that happens you may want to consider sanding part of the G10 down. Deployment with the Manix 2 is a snap. Spyderco selected an oversize 14mm thumb hole for this knife and it performs as well as it ever has. Of course, you have your standard phosphor bronze bushings which help speed things along, but I find the weight of the blade makes this knife deploy with great ease and authority. The Manix 2 has a pretty unique locking system. It is a “ball lock” and it functions in fashion similar to a Benchmade Axis lock. A spring loaded piece (in this case a steel ball bearing partially encased in a chunk of polymer resin) is what holds the blade in place. The knife has a very solid lockup that can be disengaged without putting your fingers across the path of the blade. Note that the spring is very strong on this ball lock so it can be difficult disengage the lock with one hand and it may stick a little until the lock has fully broken in. I’ve found that it is entirely possible with a little practice to disengage the lock one handed (especially once the spring breaks in a little), but there may be a slight learning curve. Also, please keep in mind what I said in the “purpose” section about spine whacks – while I think this is a very strong lock, it does appear to have an Achilles heel and there are confirmed reports of the lock failing when subjecting to spine whacks. I never advocate “spine whacking” a folding knife, but I want “keep it real” here and help you make a decision that is right for you. Update – Apparently Spyderco has since fixed the problem with the lock mechanism failing when spine whacked. These new knives have a black ball lock rather than a clear one. I have yet to get my hands on one of these new versions, so maybe it’s time I picked up a new Manix 2 XL and checked it out. Currently you can get a Manix 2 for right around $80 shipped, and a low as $70 shipped if you want a combo edge or serrated version. At either price I think the Manix packs a ton of value. When you consider that this knife has excellent blade steel, an awesome handle, a rock solid locking mechanism AND is made in the United States, it definitely has some value. Also, this isn’t some dinky folder either. This thing is built tough and I would put the ball lock right up there with the Axis lock and could see this knife being used hard for a long time. Spyderco has done it again. The Manix 2 pretty much has it all. Two of my biggest gripes include that the knife doesn’t come with a fully flat ground blade, and it’s heavy. If you opt for a sprint run version you can avoid these negative aspects. I also tend to find the ball lock a little clunky in comparison to an axis lock, but I know plenty of people who prefer Spyderco’s ball lock. While I can’t say it’s my absolute favorite Spyderco (I’d put both the Sage 1 and Paramilitary 2 ahead of the Manix – just my preference), it’s a beefy knife with solid ergonomics, and is both well thought out and highly functional. Although the price tag has crept up over the years, I also like how the Manix 2 is made in America and can be had for under $100. The collect-ability of the knife is also very cool as Spyderco has released numerous Sprint Runs and spin off versions of the knife. 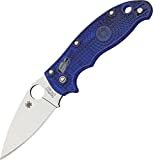 I recommend purchasing the Manix 2 at Amazon.com or BladeHQ. Purchasing anything through any of the links on this site helps support BladeReviews.com. Any and all support is greatly appreciated! Thank you very much. Photo Credits: Many thanks to Cougar337 for the beautiful Manix 2 photographs! Thanks again! !